Ambulances are no longer simply a means of transporting the ill and injured to an established medical centre. In many ways, and in many places, they’ve evolved into some truly spectacular feats of engineering and technology, and are equipped with facilities that rival all but the most cutting edge hospitals. These developments have proven invaluable in saving human lives because ambulances are the first point of contact between patients and trained medical staff, and actions taken during the first hour of a patient’s life following a traumatic incident are the most crucial in ensuring their survival. The new generation of ambulances allow EMTs to administer lifesaving procedures to patients while on the way to the hospital, as opposed to losing out on precious minutes while in transit. 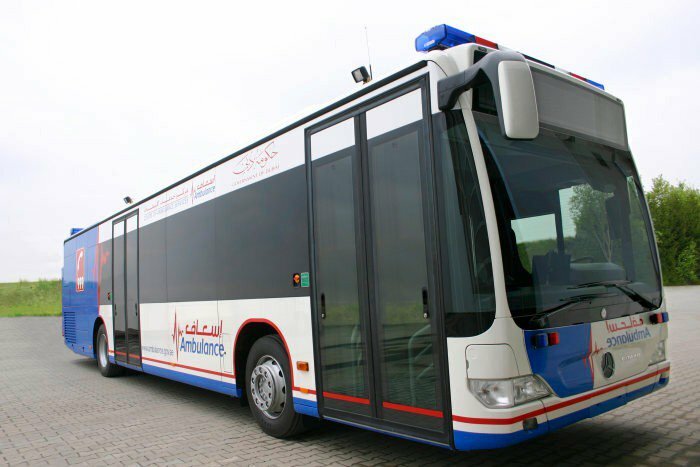 The world’s largest and arguably most well equipped ambulances are Dubai’s fleet of heavily modified Mercedes-Benz Citaro buses, which were commissioned in 2009. To call them ambulances would be an understatement, for all intents and purposes, these vehicles are mobile hospitals. Dubai is famous for its over-the-top vehicles like Lamborghini police cars, and Uber Helicopters, but even they pale in comparison to the sheer complexity and ambitiousness of its newest class of extreme ambulances. The three vehicles in the fleet have been imaginatively named A, B, and C, each have a very different role which influences their choice of on-board equipment and staff. Bus A has an inbuilt Intensive Care Unit (ICU), Bus B is equipped to treat several dozen casualties at the same time, while Bus C serves a more mixed, multipurpose role. The intensive care bus has three observation bays that can be converted into an operating theatre, and an inbuilt ECG, and enables real time observation of the patient’s vitals. The bus’s InSpectra shock monitor is able to warn doctors of shock seconds before it occurs, so that appropriate action can be determined. The bus is also equipped with the world’s smallest X-ray unit and ultrasound devices that allow for further diagnosis, should the need arise. In terms of raw numbers, these ambulances are enormous, measuring 12 metres in length and weighing in excess of 20 tons. Dubai’s choice of bus was no accident, the fact that the Citaro is reliable vehicle with a chassis that can easily be modified to suit practically any emergency service role, played a huge role in its selection for this ambitious project. Heavily congested cities like Dubai can be a nightmare for emergency services, which is why vehicles equipped to deal with even the most horrific casualties in the case of Bus A, or multiple injuries in the case of Bus B make perfect sense. Dubai’s new generation of mobile hospitals are proof that this technology is not only possible, but feasible and practical too. In a country like India, giant ambulances capable of treating multiple casualties and supporting lifesaving surgical procedures will be an invaluable asset, particularly in rural areas which are several kilometres away from the nearest hospitals. Traffic, dilapidated roads, and the sheer size of the country make travel a difficult, time consuming process, which greatly reduce a patient’s odds of survival. This makes ambulances that can perform in-situ emergency surgeries and procedures a far more viable and effective option than those that which can merely transport patients to far-off hospitals. India does have the technology and funds to build its own fleet of high tech, super-sized ambulances, all we need is the resolve.